The best dancer and the fastest runner of SNSD. Hyoyeon is ambidextrous, she actively use both of her left hand and right hand. The other eight members think revealed that she’s SNSD’s mood maker and also the funniest member. One of her most well-known nickname is “Kim Yeolsal” (ten-year old Kim) or because her jokes are similar to that of ten-year old and she also has a lot of mood swings. Hyoyeon collects cute, colorful stationery and stickers. She hits people and tell secrets when drunks. The members revealed that the maknaes, Yoona and Seohyun, are her usual drunk “victims”. Prior to her debut, Hyoyeon traveled to Beijing, China in 2004 with Super Junior’s Siwon to learn Mandarin and more about Chinese culture. In 1999, she enrolled in Winners Dance School, a famous dance school in South Korea specializing in popping, locking, animation and various other hip-hop styles. At Winners Dance School, Hyoyeon teamed with MissA’s Min and formed a dancing duo called Little Winners. 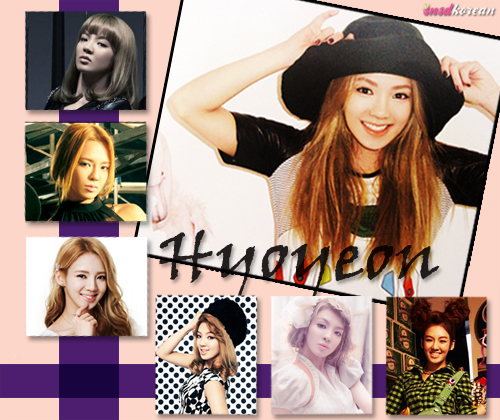 Besides Hip -hop dance, Hyoyeon also learned Jazz and Latin dance. She received dance instruction from the Electric Boogaloos and top choreographers such as Kim Hye Rang, Poppin Seen, Kwang Hoo (aka Crazy Monkey), Poppin DS, Kwon Seok-Jin (aka Locking Khan) and ex-Black Beat’s / Beat Burger’s Shim Jae Won.